Eurostar plans to start running its e320 Class 374 Velaros to Belgium in the first or second quarter of 2017. The 16-coach trains have been running between London and Paris since November last year. Siemens has delivered nine trains to the operator, with a tenth being used for testing. 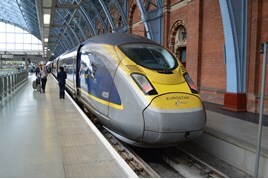 Eurostar further plans to introduce the e320s onto its new route to Amsterdam from late next year. It says that because the trains can carry around 150 more passengers than a Class 373 e300, the e320s are being used on the Paris route as that is the busiest Eurostar destination.